Never buy baby Brussels sprouts. I don’t care how cute they are–unless you’re making a clever pregnancy announcement, there is NO REASON to spend 45 minutes of your life trimming the 100 or so of them that make up a mere pound, as I did in testing this recipe. And no, I’m not pregnant. My excuse is that babies were my only option at Whole Foods on the day I shopped, and, as usual, I wanted to minimize the number of stops on the grocery store circuit that day. According to Kate’s super yummy monthly seasonal produce guides, though, these guys are still in season, and the cook time in the recipe should be about the same whether you’re using the tedious mini sprouts or the full size version, cut into quarters. This side dish recipe is super simple, but it brings unexpected punch to an otherwise bland cruciferous veggie. Sure, you could go with the foolproof buttery/bacon/balsamic preparation, with or without the trademark honey or maple syrup, but that’s not a kind choice if there are vegans at your table. Or if you’d like to save some of your calories for, say, a decadent mac and cheese, instead of spending them all on a couple chunks of bacon and half a stick of butter. Like I always say, it’s about balance. If you do choose these lighter Brussels sprouts in favor of said mac and cheese, I promise that your taste buds will not be disappointed. You’ll get the best of all worlds. After a basic oven roast in olive oil, salt, and pepper, they get a squeeze of lemon juice while they’re still sizzling away. 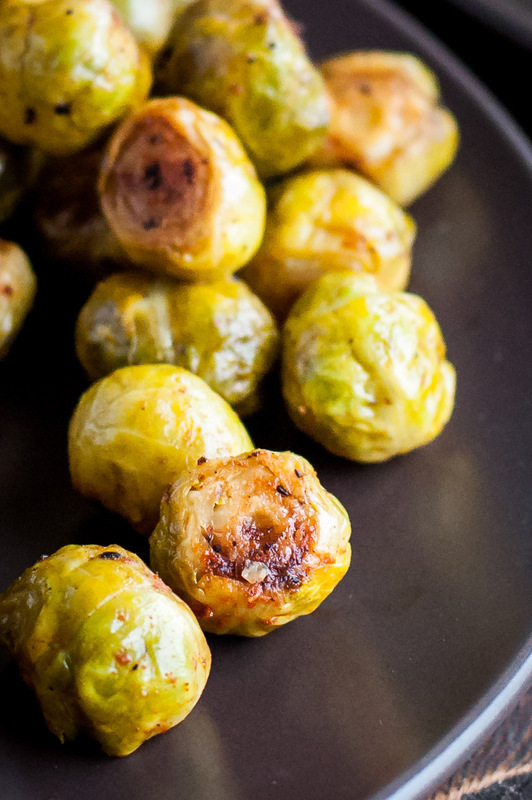 As the sprouts cool, they absorb the bright, tangy lemon flavor more than if you waited to add it until later. The sixth and last ingredient is a dusting of smoked paprika, one of my go-to bacon flavor replacements when I’m cooking plant-based. You end up with an equally rich aroma and deep, savory, even exotic, flavor. Exotic. Not to be dramatic or anything. 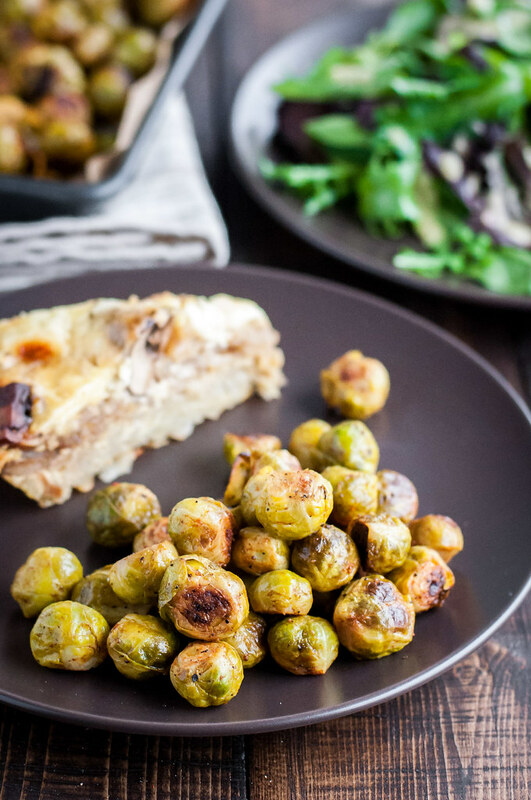 Have you noticed yet that I’m trying to tempt you with not just smoky Brussels sprouts, but a full dinner complete with my newly updated (read: faster and easier) cheesy onion tart and a green salad drizzled with dijon vinaigrette? It was as good as it looks, but the best part is that it’s not too difficult to pull together. 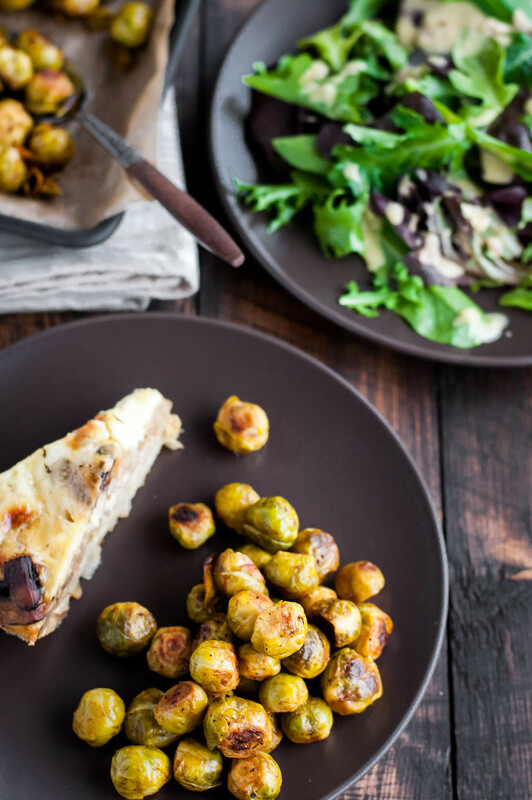 If you made the tart ahead of time, or replaced it with a slightly simpler frittata, this could well be an easy weeknight dinner. And it would surely be an easy spring lunch or light dinner for company, assuming you’ve allotted yourself a bit more prep time than on a nutty Wednesday school night. If anyone tries to tell you that gourmet weeknight dinners must be time-consuming and complex, set them straight by letting them in on these meals! Of course, I embrace months-long culinary projects, as evidenced by the sourdough starter bubbling away in my fridge, and sometimes I like to spend five hours making a single dinner. But we still all have to eat three times a day. Saving you from a hangry 5- (or 25-) year-old meltdown or from the health disaster of takeout just one night a week is just as important to me as being able to cultivate wild yeast. If you want to be the first to know when I post the recipes (for the easy dinners, not the one-week sourdough), follow me on Facebook, Instagram, or via email. Hope you have a fun weekend and, if you celebrate, an Easter filled with family, food, and (my favorite) lots of Cadbury eggs. Need a break from the bacon and butter routine? 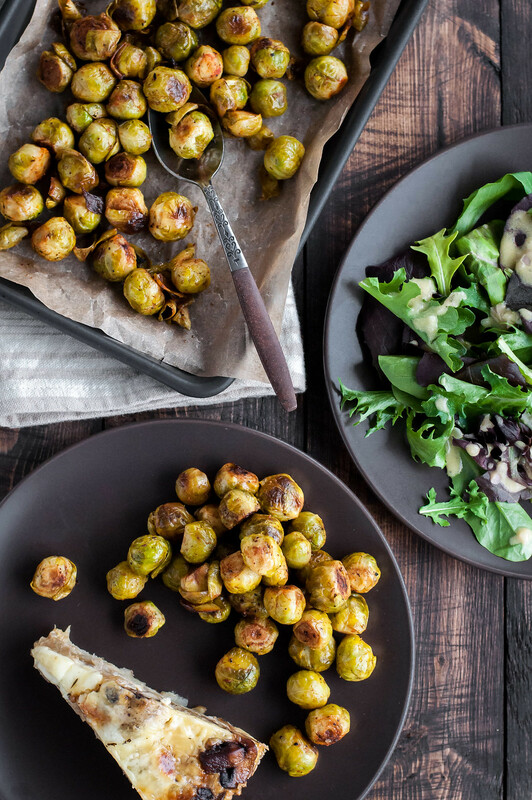 Try this quick, healthy, impressive preparation for your next batch of Brussels sprouts. Preheat oven to 425 degrees (F). 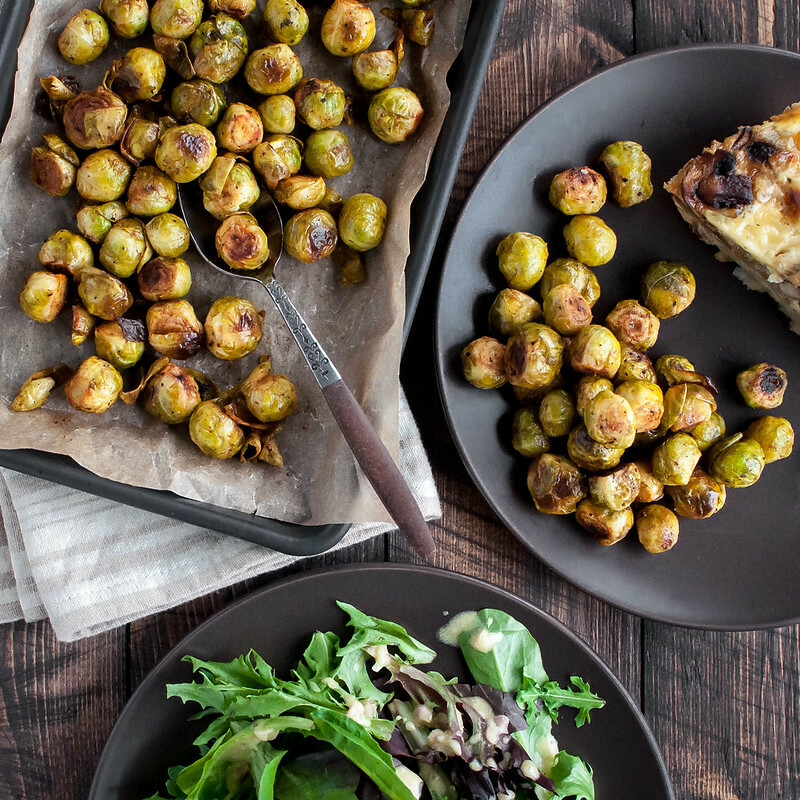 On a shallow rimmed baking sheet, toss sprouts with olive oil, ½ teaspoon salt, and pepper, coating as much surface area of the vegetables as possible. Roast in bottom third of oven for 5 minutes. Stir sprouts to expose unbrowned areas to the hot pan, then roast another 5 minutes, or until surface is mostly caramelized. Immediately toss with lemon juice on the sheet pan, then stir in smoked paprika. Sprinkle with a little more salt, to taste. Serve after cooling slightly (see notes for make-ahead storage). Nutrition: the recipe is gluten free, vegan, and super healthy. 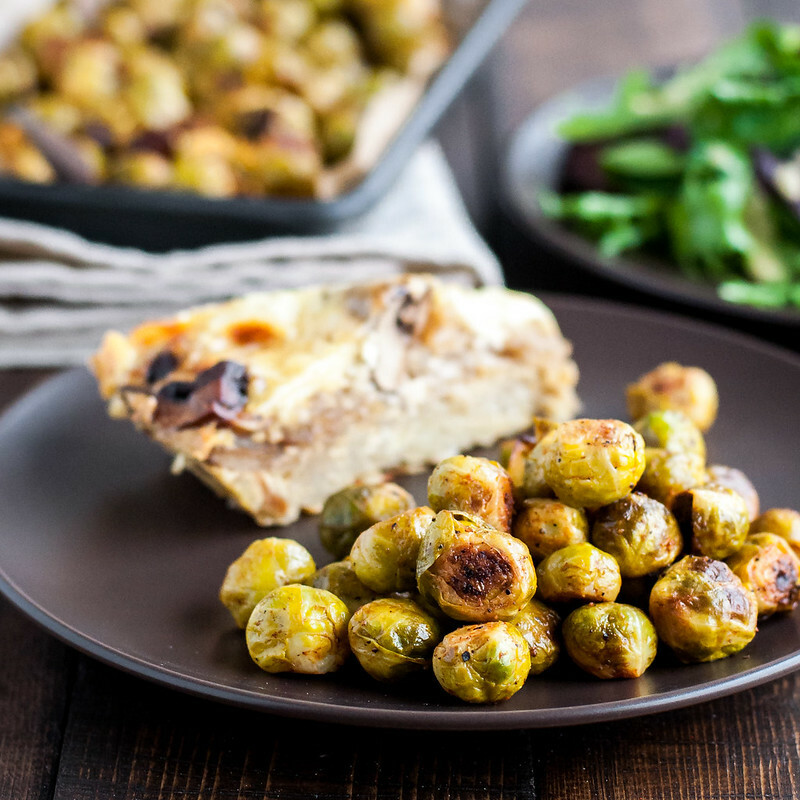 The sprouts are excellent served fresh, but they also do well kept in the fridge for a few days. For optimal texture, let them cool right on the sheet pan before piling them into an airtight container. Reheat in a 300 degree oven, uncovered, 15 to 20 minutes. You can substitute regular paprika with good results, it just won't have quite the depth and mystery of the smoked variety. Note: This page contains affiliate links. It does NOT contain sponsored content. Affiliate links (to products I recommend, on Amazon) offset my ingredient and website maintenance costs, so I can keep bringing you smoky recipes like this one. Thanks!